Earth Watch Club (EWC) held a seminar concerning global and national water crises on Thursday, 12 April. 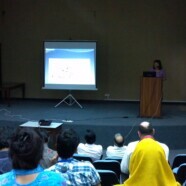 The speaker was Dr Sylvia E Benjamin, Professor Department of Chemistry FCC. Dr Sylvia talked about the consequences faced by Pakistan and the world at large due to lack of clean and safe drinking water. Pakistan was a prime focus of discussion as it greatly depends on freshwater for agriculture, livestock and domestic use. Necessary remedial measures were seen and students enthusiastically shared ideas for conserving and purifying water from around the world. Students also talked about the possibilities of initiating a ‘Clean, Safe Water Project’ at FCC.